Natural Attraction - Nature at Her Best! The Elephant Seals appearance is odd but mysteriously beautiful. You can see them any day of the week on the central coast just north of San Simeon, California. If you have never seen the magnificent seals you just don't know what you are missing. If I where you I would Take a trip to the Central Coast of California just to see these imperial giants of the sea. I promise it would be worth your time. 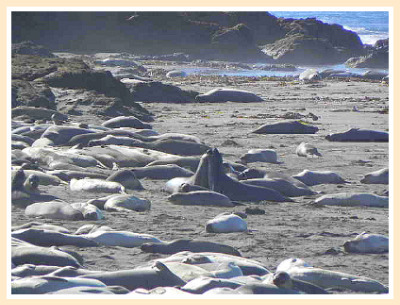 The seals are located on a lonely search of beach a few miles north of San Simeon and Hearst Castle. You can't miss them, just look to the right and you will see all the people. Let me make a suggestion. Make sure to bring a jacket. My wife and I go out to visit the seals on a regular basis and it is always cold. If you didn't bring a jacket let me suggest a great store that sells jackets, hats and much more. In fact, my wife manages Cambria Wildwood. Have you ever seen such an innocent face. Do you know the definition of the term rookery? A rookery is an animal breeding ground. 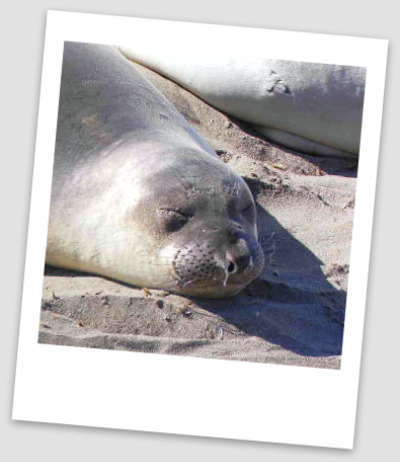 The seals come into the rookery in Piedras Blancas for breeding, giving birth, molting and rest. To read about the history of Piedras Blancas Rookery is interesting. 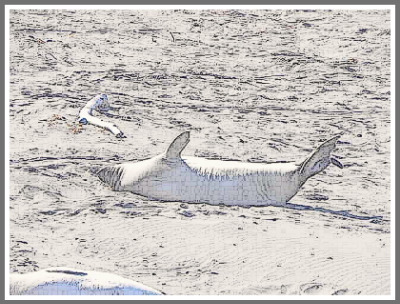 We will turn to the Friends of the Elephant Seals for help. The FES provides all the information you will ever need when it comes to the seals. If interested in learning more about the history of this fabulous creature Elephant Seals history click here. We took these pictures in late September 2010. According to the Friends of the seals this time of year is when the females come ashore to shed their old skin and grow new skin. Believe me, I am not an expert on the seals. The FES say, "Because growing new skin at sea would mean circulating hot blood outside the blubber and only fractions of an inch from 40 degree Fahrenheit water, the elephant seal and other pinnipeds have evolved to come to shore for a month, usually their home rookery, to grow new skin and shed the old once each year. Juveniles and adult females come first, sharing the beach with the weaned pups in early April and their number increasing to a maximum number of over 4000 on the two beaches adjacent to the parking area by early May. For more information Click Here. If you are planning or thinking about visiting the Central Coast and the seals please use Kayak to book your trip.